Xtralloy’s high alloy content and superior quality mean longer wear life where it matters most. 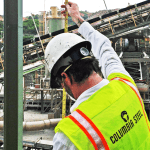 Columbia Steel’s 24% manganese steel, Xtralloy®, became a production alloy in 1988 and has been widely accepted by customers in aggregate production and ore processing as a way to reduce downtime costs. Xtralloy shows its best performance improvements when crushing tough materials. Since 1988, our Product Engineers have gained extensive experience with alloy applications in all types of crushing conditions, so they are able to estimate Xtralloy performance. Like no other alloy on the market, Xtralloy uniquely meets the need for heavy-duty premium manganese steel crusher wear parts. We can also improve the wear life ratios of opposing wear parts by using Xtralloy and standard manganese alloys.